In my work, I regularly speak in front of a crowd of people. They range from a small group of 8, to 500 or more. I speak between 35-50 times a year. I’ve been speaking at this pace for the past 3 years, and really enjoy it. I’ve also helped others with their speaking presence and craft, as they work to communicate their ideas passionately and effectively. I recently helped out a co-worker who was submitting a TEDx talk, and we worked for a couple hours on the write-up and execution of a 2 minute video. Honing your speech or video definitely takes time, but the discipline is worth it. There is no substitute for knowing your topic. If you try and wing the speech, a knowledgable audience will see through you. You can be an average speaker and still make a good speech if you are well-versed in the topic, so study up! Technique 1a is to use a type of memory technique to keep you flowing in the talk. Use note cards, a memory palace, or a monitor that faces you. Whatever helps you feel comfortable. As you continue, I think you will need them less. I used a quote at the beginning of this post. When I’m speaking about Rockmont, I give my personal story of my first summer, and how it has impacted me. Speakers regularly use statistics (the more shocking, the better) to grab audience attention from the start. The reason is that using this technique will help you establish common ground with your audience. The quote inspires or makes us laugh, a story should be relatable (remembering your first away-from-home experience), and statistics can do any number of things. But your early hook should be relatable and intriguing. I have attached a worksheet that you are free to download and use for your speaking purposes. Click to download. It is best used for review, either watching video of your own speech, or for a live reviewer. My sheet is pretty simple because I didn’t want to clutter it up. Make any adjustments you feel are necessary for your own speaking. The sheet helps me keep track of any poor communication habits I’m forming, and to focus in the essence of the speech. This is a review technique that is important, and requires someone to work with you. When you have practiced and rehearsed, grab your peer reviewer and hand him/her the worksheet. Your speaking will be helped by having even an audience of 1, and their note-taking will help you as well. The best scenario is to have a practice audience you can speak to, and a reviewer off to the side taking notes. If you care, the audience will be more likely to buy in and care. We’ve all heard dispassionate, droning speeches and lectures, and it’s plain to see that the speaker doesn’t care about the topic, so why should we? Love it, and allow your audiene to see your passion. Once again, no substitute for this. Once you have done the research and know your topic, begin practicing your speech. Your voice will sound shaky and you may have many filled pauses, weak words, and glances at your shoes, but it is better to do this during practice sessions, and not at the event. Engage your audience through eye contact, doing this lets them feel that they matter, and you care about relaying your topic. A quick look to the side or the back is fine, but don’t do it often. People are going to wonder what’s so interesting about the stage you keep looking at. Your reviewer will be able to help with this as well, and the worksheet has a box for tracking. Ask a friend or co-worker to film your practice sessions and live talks. Two reasons for this: A, it will give you an opportunity to critique yourself before the live event. Sports teams have been watching film of their performance for years, so they can see what needs to be improved. B, filming live events will allow you to post your live talks on your site, adding credibility to the fact you can speak in public. If your first talk doesn’t go well, do not despair, many do not! If you knock it out of the park, good for you! In either scenario, keep showing up and speaking again, continuing to hone your voice and craft. Practice, review, practice, review, speak. Find opportunities to speak at Toastmasters, Pecha Kucha, Trade Shows, and Conferences. If you’re still in school, you will be greatly admired for having the courage to speak in front of your class. But keeping showing up and doing the work, and people will certainly respect that. Seth Godin has said, “The ideas that spread, win”. Social media and web 2.0 have enabled you to be a part of the conversation, to be an influence, and spread ideas. 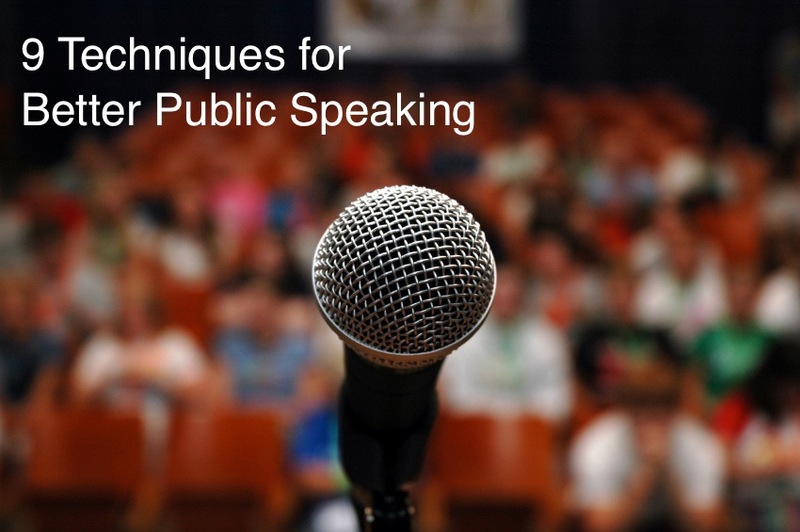 Public speaking is a great way to communicate face-to-face about ideas and issues you are passionate about. Put in the work and make your time count. There is my list, what are your thoughts, and can you help add to it? P.S. If you would like help with your speech, or have any additional questions, please let me know! This entry was posted in Business & Design, Creativity and tagged change the world, giving a speech, initiative, poke the box, presentation design, public speaking, public speaking techniques, seth godin, starting by mattragland. Bookmark the permalink.